Anxiety is a condition in which a person is chronically and excessively worried about everyday situations. Many different events and thoughts can trigger anxious feelings; for example, some people might experience terror at the thought of being in a social situation, or some might have irrational worries about the health of loved ones. This chronic sense of disaster or dread can range from mild to very severe and has potential to negatively impact daily life. Read on to learn more about the symptoms of anxiety. Anxiety can induce the release of high amounts of the stress hormone cortisol, which can have unpleasant effects on the body and mind. 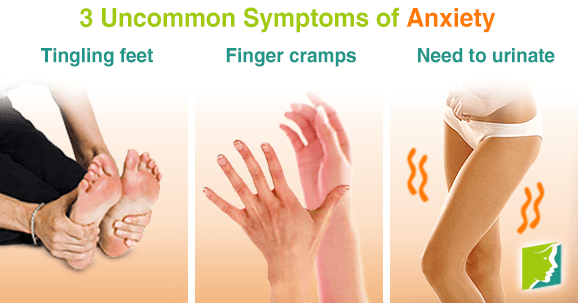 The common symptoms of anxiety that most are familiar with include nausea, tension, sweating, and increased heart rate, but there is also a range of less common symptoms that can accompany the condition. These can often be a symptom of a symptom (for example, consequences of anxiety-induced symptoms, like the effects of hyperventilation), or they can be no different from what an average person feels, but given much more psychological weight by someone with anxiety. A few examples of uncommon symptoms of anxiety are listed below. This has been reported differently by various people with anxiety, from feeling like feet are asleep to a painful or burning feeling. Tingling feet can be symptomatic of other conditions, so to ensure that it is anxiety-induced, it is advisable to seek medical advice in order to identify the cause. Tingling feet could be due to magnesium reserves being low, which sometimes happens in people with high amounts of stress. It can also be heightened psychological sensitivity to normal bodily sensations that wouldn't concern most people. This can often be a result of hyperventilation. In normal breathing, oxygen is breathed in and carbon dioxide is breathed out. The amount of both in the body is a delicate balance. Therefore, with rapid breathing (hyperventilation) that can be triggered by anxiety attacks, the amount of oxygen in the blood is higher than normal. This can lead to rarer symptoms of anxiety, such as finger cramps. Anxiety causes high levels of stress, and stress can affect the body in many different ways. This can sometimes lead to uncommon symptoms, such as the sudden need to urinate. Anxiety is a complex condition that can have a myriad of different physiological and psychological effects, some of which can be very unexpected. The symptoms of anxiety can often mimic symptoms of other conditions, so anyone who is experiencing intense or highly unusual symptoms should talk to a doctor in order to make sure they are anxiety-related and not a sign of another problem. For further tips on how to handle anxiety click here.